That’s a comment from one very impressed commentator on a brand-new footbridge gracing Auckland’s waterfront – a project in which BBR Contech was delighted to be involved. The new Point Resolution Bridge replaces one originally built in two sections (in 1927 and 1972) to connect Tamaki Drive with the Parnell Baths. When engineering experts assessed it as in urgent need of refurbishment owing to corroded steelwork, the powers-that-be went looking for a long-term solution. The result is this glorious new structure, designed by award-winning architecture firm Warren and Mahoney. 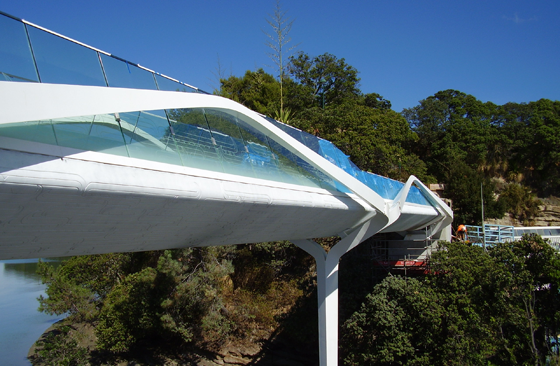 The bridge is made up of a simple post-tensioned concrete beam – a hull-like shape that connects it to the harbour and yachts beyond – which is threaded through a delicate painted-steel structure of three sculpted arches connected by simple glass balustrades. Both the deck and the balustrades provide a palette for specially commissioned artwork that incorporates ‘pungarungaru’ (ripples on the water). The bridge’s elegant simplicity belies the complexity of the project behind its construction. Duncan says that great teamwork was key to the project’s success, especially given a construction timeframe of just 12 months. That included working with BBR Contech to ensure integrity in the concrete beams through a comprehensive post-tensioning process. The work started off-site, where the three beams were precast and post-tensioned using tendons of between 22 and 25 stands, each 15.2mm thick. On arrival at the site each beam was then stressed using our brand-new 700-tonne jack (a significant step up from its previous 500-tonne counterpart), with the largest beam stressed to 460 tonnes.